Have you ever eaten cannoli? 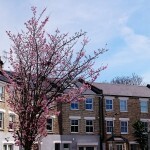 If not, I advise you to stop reading this blog post and go and find yourself some immediately. There’s a little Italian deli on the Cowley Road in Oxford called Il Principe, and it sells properly lovely and authentic Italian food. I mean, I assume it’s authentic. The owners are Italian and I’m not, so what do I know? Anyway, they do an irresistible cannoli. A crisp, fried tube of delicate pastry, filled with ricotta and mixed peel, finished with dark chocolate and icing sugar. It is one of my favourite treats. 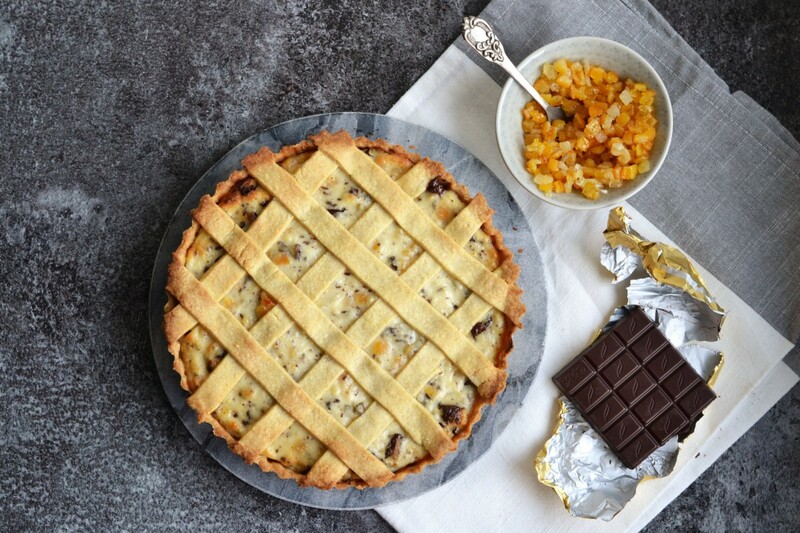 And so I was always going to love this Ricotta, Citrus, and Chocolate Tart. 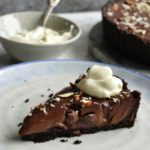 Yes, I know I did a chocolate tart pretty recently. But this is a totally different being. You may well ask why I didn’t just make cannoli, if I love them so much. 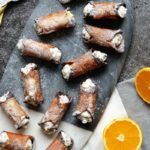 The problem is that, although you can buy ready-made cannoli shells, they’re pretty difficult to get hold of. They’re also not a patch on the freshly handmade variety. And to make them by hand you need to buy special cannoli tubes to shape the dough around while it’s fried. Even I, a great lover of kitchen equipment, don’t think I could really justify such a purchase. To make it a legitimate buy, I’d have to make cannoli every week. And while, in principle, that sounds like a fabulous idea, in practice I feel logistical issues and health worries might render it impractical as a lifestyle choice. The proper name for this recipe is Torta Squisita, according to Amelia, my friend and former colleague. She’s spent half her life in Italy, speaks the language and knows the food. It was she who introduced me to the original recipe for this tart, before I messed with it. I’ve made changes, of course, and fiddled with the method, which is why it’s been rechristened as Ricotta, Citrus, and Chocolate Tart. It’s not as pretty a name. But it tells you what it is, and I don’t want to go pretending my version is the proper Italian deal, because it isn’t. It’s really, really delicious though. 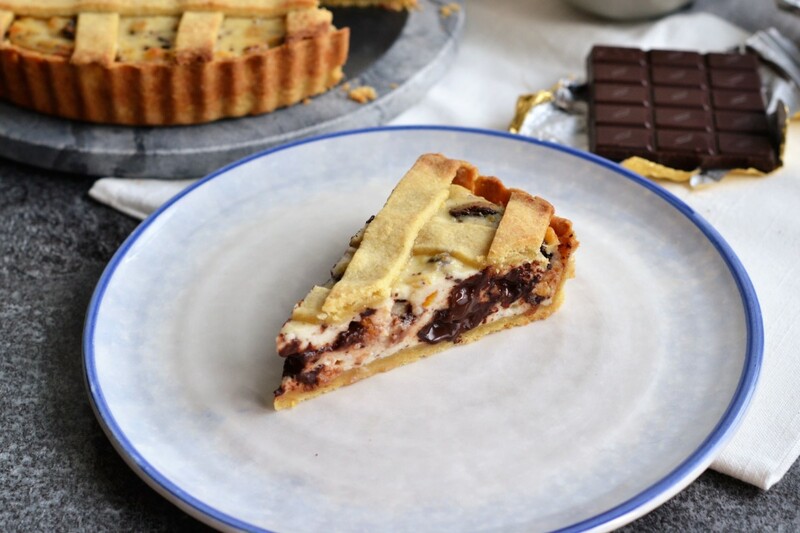 Golden, lemon-scented pastry holds a filling of baked ricotta, studded with candied citrus peel and rich flakes of dark chocolate. It’s decadent, and a little bit unusual if you’re looking for something different. 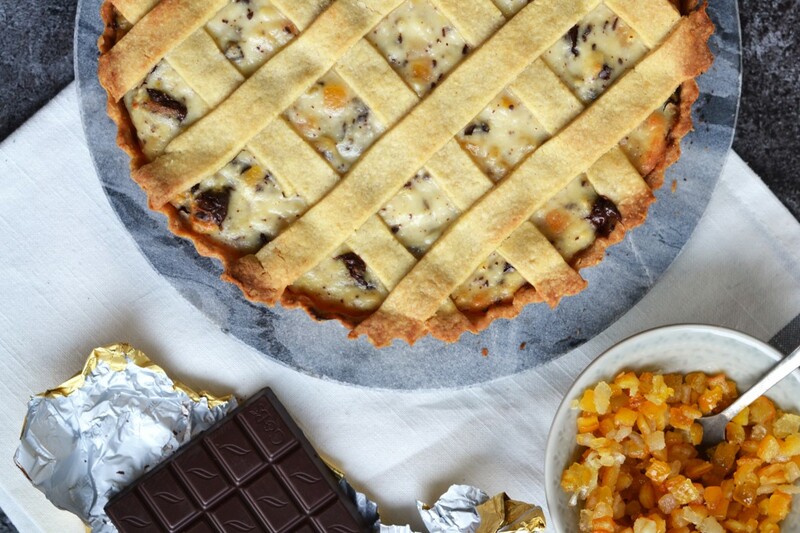 When I make this tart, I have to give it away fairly quickly, because I cannot be trusted around it. It’s genuinely one of my absolute favourite desserts. If left alone with it, I will demolish it single-handedly in an embarrassingly short amount of time. 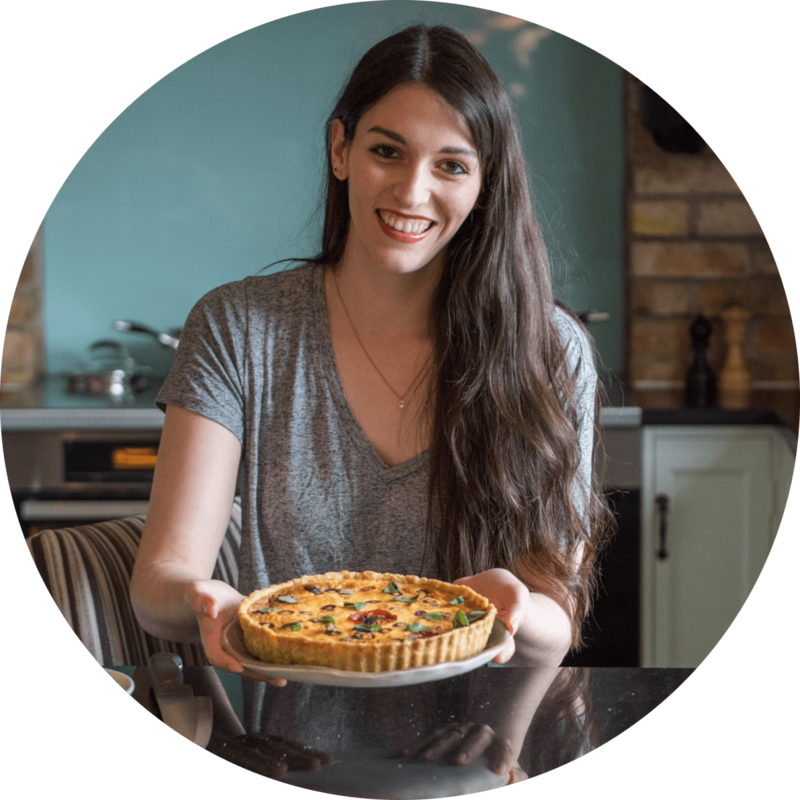 The original recipe for this tart comes from the lovely Amelia Earl, who I used to work with at the cookery school. 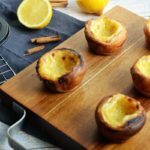 Making your own pastry for this is best, because this recipe will give you a rich, buttery, lemon-y base for the tart. 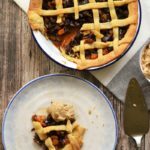 However, if you’re in a rush or simply cannot be bothered to make your own pastry, then a couple of sheets of shop-bought shortcrust will do as a substitute in a pinch. 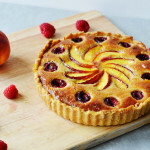 If you like, you can completely skip the lattice top to this, and simply bake the tart with an open top. First, make your pastry. Put your flour, salt, sugar, and lemon zest in a food processor. Give it a quick blitz to combine. Add your cubed butter, and pulse until the mixture resembles breadcrumbs. Add your eggs yolks and 2 tbsp cold water, and pulse until the pastry starts to come together. If it doesn’t come together and still seems dry, add more water 1 tbsp at a time until it is a cohesive pastry. Tip it out onto clingfilm and knead it together briefly. Divide it into two chunks, one being 3/4 of the total pastry and the other 1/4. You can also leave it in one big piece if you don’t want to do a lattice top. Shape each chunk into a disc, wrap in clingfilm. Chill in the fridge for around 20 minutes, or until fairly firm. While your pastry chills, make your filling. Mix your ricotta, candied peel, dark chocolate, sugar, and egg together until just combined, and set aside. Heat your oven to 190C/170C fan. Roll out your larger piece of pastry and use it to line a tart tin (roughly 23cm in diameter). Trim the edges. If your pastry has become very soft, pop the tin in the fridge for ten minutes or so to let the pastry firm up before it goes in the oven. When you’re ready, line the pastry case with baking paper, then fill with baking beans or rice, and bake blind for around 10 minutes. Remove the paper and beans and bake for around another five minutes. You want the pastry to have lost its rawness and started to colour lightly. While the case is baking, if you’re planning to do a lattice top, roll out your smaller piece of pastry into a rough rectangle and cut it into long strips. When your pastry case is blind baked, pour your filling into the tart case, and smooth the top. If you’re doing a lattice, lay your strips of pastry in your prepared pattern over the filling. You’re supposed to weave them in and out for a proper lattice, but I always just lay them on top of each other! Pop the whole thing back in the oven and bake for around 30 minutes, or until the lattice pastry is baked and golden and the tart filling is set. Let the tart cool for five or 10 minutes, but do remove it from the tin while it’s still warm, or it could stick.